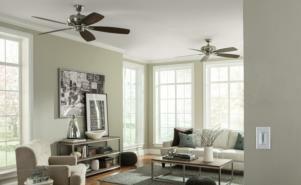 Monte Carlo’s Embassy Max ceiling fan provides maximum airflow with a smooth and fluid design. This transitional fan is offered in four finishes with reversible, dual-finished blades and a dual mount canopy to accommodate rooms of just about any decor and height. The blades are double beveled, which results in better air flow, increased energy efficiency, and tailored look. Embassy Max delivers 7,644 CFM (cubic feet of air per minute) with a 60” blade sweep and 3-speed, pull chain operation. Compatible with both a remote control and light kit that are sold separately.